I love apples, and I LOVE apple season. Here in the Northeast, we grow a lot of apples. When Fall comes around, you can never be far from a dessert based on an apple. Are you hungry? 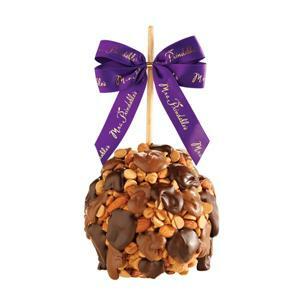 Nothing beats a candied apple or a caramel apple. If you don’t live near a farm market where you can buy a good one, check out Mrs. Prindable’s online. This stuff is amazing, and tastes as good as it looks. Think of… an apple with your favorite candy bar in one bite! I buy these by the truckload for the holiday and give out as gifts. So glad your back! I was a little worried. I *LOVE* Mrs. Prindibles. I order them every year at the holidays. Now me thinking I want to order a little earlier!! !